Osteochondroma is the second most common benign bone tumor and the diagnosis of clavicular osteochondroma should be considered in any patient with shoulder impingement syndrome. Department of Advanced Biomedical Sciences, UniversitàdegliStudi Federico II ~ via Pansini 5, 80131, Napoli, Italy. 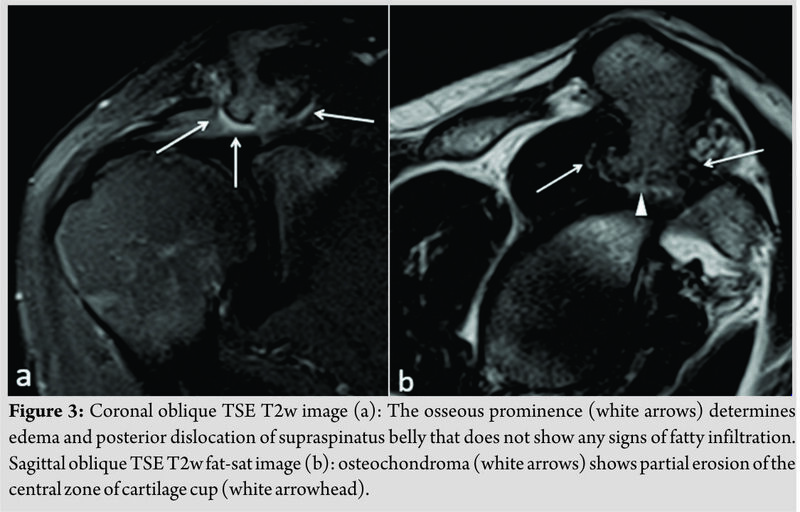 Case Report: We presented a case of 27-year-old male with clavicular impingement syndrome secondary to osteochondroma. He received conservative treatment before the diagnosis of the osteochondroma. Radiograph, computed tomography, and magnetic resonance imaging of the shoulder were performed. As the failure of non-operative treatment, the patient underwent to open surgical procedure with the excision of the osteochondroma. Conclusion: Clavicular osteochondroma is a very rare cause of impingement syndrome, and it may cause severe shoulder impingement with reduction of the range of movements. Osteochondroma may be complicated by a number of secondary abnormalities, including inflammatory changes of the bursa exostotica (“exostosis bursata”) covering the cartilaginous cap, pressure on nerves, blood vessels, and the adjacent bone. The least common complication seen in <1% of cases of solitary lesions is malignant transformation to chondrosarcoma. The diagnosis of clavicular osteochondroma should be considered in any patient with shoulder impingement syndrome, and good functional results can be expected following total excision. Keywords: Bonetumor, osteochondroma, magnetic resonance. Impingement syndrome is one of the most common pain disorders of the shoulder; it may be due to structural alteration of acromion, coracoacromial ligament, acromioclavicular joint, biceps tendon or coracoid process; however, in rare cases, impingement syndrome may be due also by benign tumors like osteochondroma. Osteochondroma is the second most common benign bone tumor following non-ossifying fibroma . These lesions are thought to arise from the aberrant growth of normal epiphyseal growth plate cartilage . 90% of osteochondromas arise from the metaphyseal regions of long bones (e.g., distal, femur, proximal tibia, or proximal humerus) , while isolated clavicle localization is a rare entity . 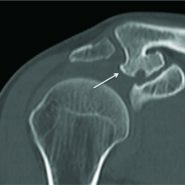 This article presents a rare case of impingement syndrome caused by mechanical irritation of the rotator cuff by an osteochondroma of the inferior face of the lateral third of the clavicle. A 27-year-old male presented with 3–4 months’ duration of severe right shoulder pain. He was in systemic steroid treatment for ankylosing spondylitis for 4 years. The pain was continuous with no antecedent trauma. Conservative treatments were proposed with anti-inflammatories, activity modification, physical therapy, and a subacromial corticosteroid injection with moderate pain relief. He reported no constitutional symptoms such as fever, weight loss, night sweats, or chills. Examination of the shoulder revealed slight atrophy of supraspinatus muscle, no deformity, or scapular dyskinesis. There was focal tenderness to palpation over the acromioclavicular joint. Range of motion testing revealed 80° forward flexion, 60° abduction, 20° external rotation, and internal rotation to sacroiliac joint, all with exacerbated pain. Impingement signs were present with positive Neer and Hawkins maneuvers. Jobe test was positive. No abnormal bony prominences or lymphadenopathy was noted on the remainder of the patient’s extremities or axial skeleton. 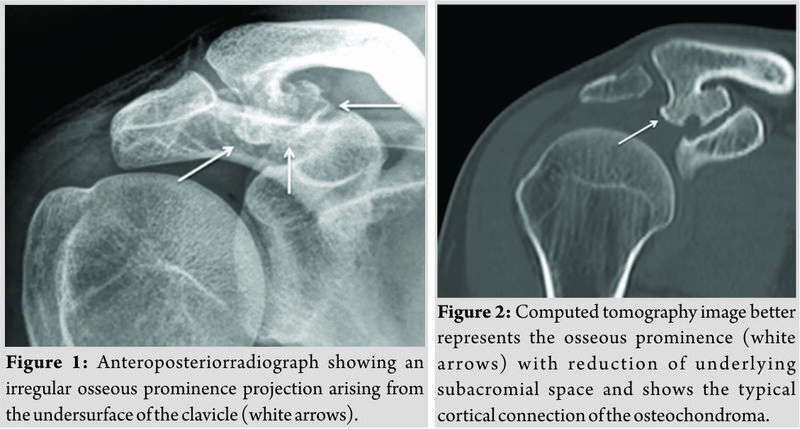 Plain radiography of the shoulder shows a bony prominence protruded inferiorly from the undersurface of the clavicle with the reduction of subacromial sliding space (Fig.1). Computed tomography images better show osseous prominence near acromioclavicular joint with the cortical connection. This lesion has a maximum diameter on the coronary plane of 22 mm and on the sagittal plane of 26 mm with cortical implant of 9 mm (Fig.2). Magnetic resonance imaging examination revealed the cartilage cap of the exostosis which, at the center zone, shows irregular continuous solution extended to the underlying subchondral bone (Fig.3a). The osteochondroma compressed and displaced posteriorly the supraspinatusmuscular belly that shows edema but preserve sregulartropism (Fig.3b). As the patient had failed non-operative treatment, he elected to undergo excision of the osteochondroma. 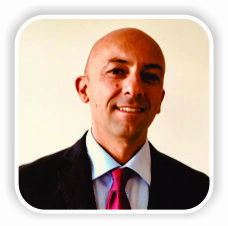 An arthroscopic diagnostic procedure was performed by a senior experienced shoulder surgeon (AMR). No intra-articular pathology was found. Abundant subacromial bursitis was noted. The bony prominence was seen abrading the supraspinatus muscle belly, creating a rent in the muscle. The rotator cuff tendons were intact, but supraspinatus tendon seemed to be lightly damaged at muscle-tendon junction. After subacromial bursectomy, the osseous prominence was visualized. The size of the neoformation made it difficult to remove without cutting. The decision was for open surgery. A 5-cm incision centered on the acromioclavicular joint was developed; after a deltoid split, osteochondroma underwent to removal. Anatomic-pathologic examination of the mass was diagnostic of osteochondroma of the clavicle. The patient began immediate physical therapy. He resumed full activity, including tennis and ice hockey, with no restriction or pain within 1 month after surgery. Post-operative range of motion testing revealed symmetric motion to the contralateral limb with 170° forward flexion, 90° abduction, 60° external rotation with the arm at the side, and internal rotation to T10. He increased 24/25 strength of the deltoid and rotator cuff postoperatively. He is currently doing well and is satisfied with his outcome thus far, nearly 1 year postoperatively. 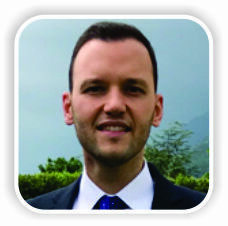 Repeat post-operative imaging studies have revealed no recurrence. Osteochondroma, also known as osteocartilaginous exostosis, is characterized by a cartilage-capped bony projection on the external surface of a bone [5,6]. It is usually diagnosed in patients before their third decade. Osteochondroma, which has its own growth plate, usually stops growing at skeletal maturity. Variants of osteochondroma include subungual exostosis, turret exostosis, traction exostosis, bizarre parostealosteochondromatous proliferation, florid reactive periostitis, and dysplasia epiphysealishemimelica (also called intra-articular osteochondroma) . Histologically, the osteochondroma cap is composed of hyaline cartilage arranged similarly to that of a growth plate; a zone of calcification in the chondro-osseous portion of the stalk corresponds to the zone of provisional calcification of the physis . Beneath this zone, there is vascular invasion and replacement of the calcified cartilage by new bone formation, which undergoes maturation and merges with the cancellous bone of the host bone’s medullary cavity . They are often asymptomatic unless associated with a painful bursitis, osseous deformity, mechanical irritation of the rotator cuff, and impingement on neurovascular structures . It causes pain which is thought to be caused by the encroachment of coracoacromial arch on the bursa and cuff [9,10]. Osteochondroma may be complicated by a number of secondary abnormalities, including inflammatory changes of the bursa exostotica (“exostosis bursata”) covering the cartilaginous cap, pressure on nerves, blood vessels, and the adjacent bone. The least common complication seen in <1% of cases of solitary lesions is malignant transformation to chondrosarcoma. Malignant transformation to chondrosarcoma occurs in 1%–2% of solitary osteochondromas and 5%–25% of cases of multiple hereditary exostoses . This transformation is typically accompanied by new onset pain and continued growth of the osteochondroma . When symptomatic osteochondromas fail non-operative treatment, they often respond favorably to resection to reduce snapping and restore function . 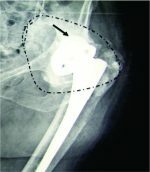 Osteochondroma should be treated with total excision with open or arthroscopic techniques . 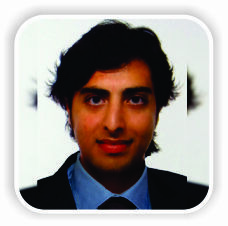 Recurrences can be seen in 2% of the cases due to insufficient removal of the lesion . Arthroscopic total excision of the tumor may not always be possible. 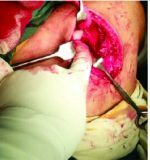 Surgeon’s experience, localization, and size of the lesion are important factors for appropriate excision with arthroscopy . Osteochondroma is the second most common benign bone tumor following non-ossifying fibroma . Osteochondromas are often asymptomatic unless associated with a painful bursitis, cosmetic deformity, mechanical irritation during joint motion, impingement on neurovascular structures, or malignant transformation to chondrosarcoma . When symptomatic clavicular osteochondromas fail non-operative treatment, they often respond favorably to resection to reduce snapping and restore function . The diagnosis of clavicular osteochondroma should be considered in any patient with shoulder impingement syndrome, and good functional results can be expected the following total excision. 1. Mercuri M, Picci P, Campanacci L, Rulli E. Dedifferentiated chondrosarcoma. Skeletal Radiol1995;2:409-16. 2. Frost NL, Parada SA, Manoso MW, Arrington E, Benfanti P. Scapular osteochondromas treated with surgical excision. Orthopedics 2010;33:804. 3. Milgram JW. The origins of osteochondromas and enchondromas. A histopathologic study. Clin OrthopRelat Res1983;174:264-84. 4. Fallon PJ, Hollinshead RM. Solitary osteochondroma of the distal clavicle causing a full-thickness rotator cuff tear. J Shoulder Elb Surg1994;3:266-9. 5. Fukunaga S, Futani H, Yoshiya S. Endoscopically assisted resection of a scapular osteochondroma causing snapping scapula syndrome. World J Surg Oncol2007;5:37. 6. Bain GI, Itoi E, di Giacomo G, Sugaya H. Normal and Pathological Anatomy of the Shoulder. New York: Springer; 2015. 7. Murphey MD, Choi JJ, Kransdorf MJ, Flemming DJ, Gannon FH. Imaging of Osteochondroma: Variants and complications with radiologic-pathologic correlation. Radiographics2000;20:1407-34. 8. Lyons TJ, McClure SF, Stoddart RW, McClure J. The normal human chondro-osseous junctional region: Evidence for contact of uncalcified cartilage with subchondral bone and marrow spaces. BMC MusculoskeletDisord2006;7:52. 9. Lunsjö K, Bengtsson M, Nordqvist A, Abu-Zidan FM. Patients with shoulder impingement remain satisfied 6 years after arthroscopic subacromial decompression. Acta Orthop2011;82:711-3. 10. Min KS, Pierre P, Ryan PM, Marchant BG, Wilson CJ, Arrington ED. A double-blind randomized controlled trial comparing the effects of subacromial injection with corticosteroid versus NSAID in patients with shoulder impingement syndrome. J Shoulder Elb Surg2013;22:595-601. 11. Woertler K, Lindner N, Gosheger G, Brinkschmidt C, Heindel W. Osteochondroma: MR imaging of tumor-related complications. Eur Radiol2000;10:832-40. 12. Goud AL, Wuyts W, Bessems J, Bramer J, van der Woude HJ, Ham J. Intraosseous atypical chondroid tumor or chondrosarcoma grade 1 in patients with multiple osteochondromas. J Bone Joint Surg Am2015;97:24-31. 13. Jupiter S. Clavicular nonunion and malunion: Evaluation and surgical management. J Am AcadOrthop Surg1996;4:1-8. 14. Kim JP, Seo JB, Park HG, Park YH. Arthroscopic excision of dorsal wrist ganglion: Factors related to recurrence and postoperative residual pain. 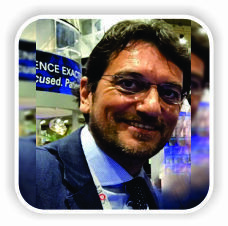 Arthrosc J ArthroscRelat Surg2013;29:1019-24. 15. Lu MT, Abboud JA. Subacromial osteochondroma. Orthopedics2011;34:581-3. 16. Chin KR, Kharrazi FD, Miller BS, Mankin HJ, Gebhardt MC. Osteochondromas of the distal aspect of the tibia or fibula: Natural history and treatment. J Bone Jt Surg Ser A2000;82:1269-78. 17. Kuhne M, Boniquit N, Ghodadra N, Romeo AA, Provencher MT. The snapping scapula: Diagnosis and treatment. Arthrosc J ArthroscRelat Surg2009;25:1298-311. 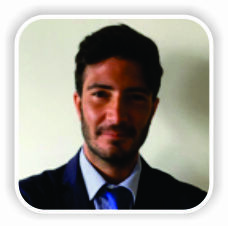 How to Cite This Article: Simonetti I, Chianca V, Ascione F, Romano A M, Pietto F D. Clavicular Osteochondroma: Extremely Rare Cause of Impingement Syndrome. . Journal of Orthopaedic Case Reports 2018 Nov-Dec; 8(6): 50-53.